It happens, authors know it but dread it just the same. Not many books live forever. Or do they? That used to be the reality. When a book ceased to sell enough copies to satisfy the publisher, they put it out of print. An author can get the rights back (the rights to the story, not the cover or artwork) but in most cases that was the end of the line. Was. Now authors can easily reprint their books or put them out as ebooks, or both. With a fresh cover and more opportunities to reach readers through social media outlets, a book can live again. When it went out of print, they allowed me to purchase the remaining stock. I still have a few boxes of the print version that I sell for just five bucks. But, in 2006 nobody was doing ebooks. Well, almost no one. Certainly not Monarch Books. My friend Deirdra Doan and I have bartered back and forth for editing (me) and artwork (her.) She has read this book and when it came time to create a new cover, she introduced me to her friend Kim Draper. I’m so glad she did! Kim created a lovely cover that I feel conveys the mystery and intrigue of the story. I chose to publish the ebook on Kindle exclusively for now because most ebooks are sold on Amazon and even if a reader doesn’t have a Kindle, he or she can download the app on their computer for free and read it there. Here is the buy link. That is my goal. 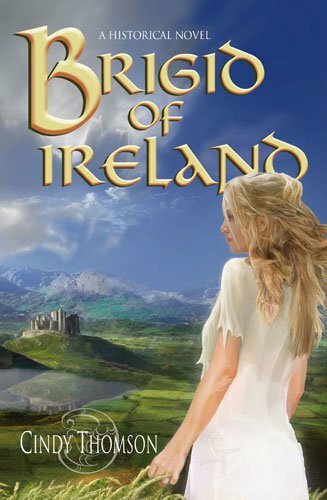 I have heard from so many readers over the years who have enjoyed Brigid of Ireland, but of course there are many more who have never read it. I’m aware that some people prefer to read ebooks, and some for physical readers must read electronically. These days novels are published in both print and ebook formats (as are Grace’s Pictures and Annie’s Stories.) Some may wish to go back and read my first novel after they read those two, and now they can! When Brigid of Ireland first came out, my publisher and I were thinking the book was for adults. But so very many young girls have enjoyed it, and there is nothing objectionable that should prevent them from doing so. I have signed the book for girls as young as nine! Of course, these girls are reading above their grade levels. I’m mentioning this in case there is anyone out there is looking for an adventure story set in ancient Ireland for a young reader. Maybe for a Christmas gift? At one of my first book signings a young girl and her father paused at my table. The girl told her father she loved that book. I was amazed she had read it! She told me she read it for a book report for school. As a former teacher and a current mentor to some young writers, that really made my day. Well, my year at the least. Seeing as there is lots of action in the story, I think boys would like it too, but of course girls relate to Brigid who is a young woman in the story. One of my earliest fans was the 14-year-old daughter of one my fellow novelists. When I sent my friend my new novel, her daughter snatched it from her to-be-read pile and read it first! I sent her a t-shirt. She is a young woman today, but this was her then. My name is Jenni and I’m a freshman at Concordia-Academy Bloomington (a Lutheran high school). I love to read and am currently working on writing a novel of my own. I like fencing and archery, playing flute, piano and guitar, and I hate geometry (but like algebra). I took Brigid of Ireland from the stack of my mom’s books because the description on the back cover sounded interesting, and the cover was pretty. I liked the chapter openings with quotes – some Bible verses and some Celtic blessings or sayings. 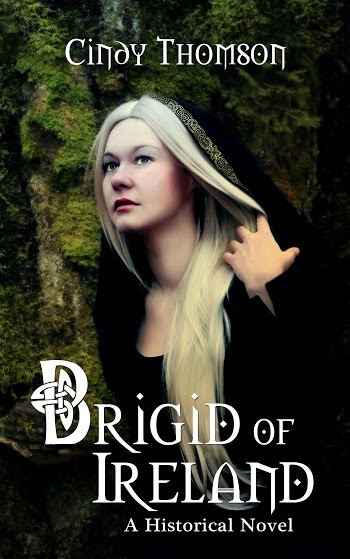 But most of all, I absolutely loved the STORY of Brigid of Ireland. It has such a gripping plot, and is a great inspiration to my faith. I’ve recommended it to all of my friends, knowing that they would love the suspense and heartbreak in it, as well as the spirituality. I admire Brigid’s strong faith throughout all her troubles. It gives me strength to go through tough things. In addition to sharing this terrific book with adult friends, consider buying a copy for a daughter, student, niece, or other young woman in your life! And Finally, Something for you! 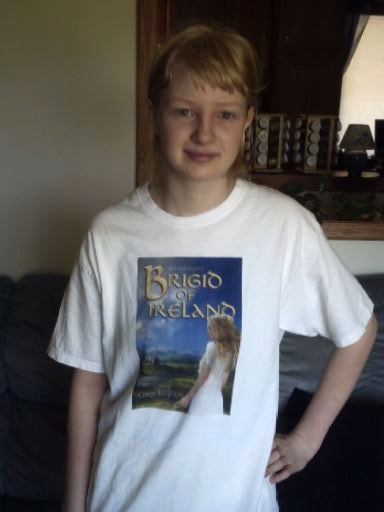 Who would you recommend Brigid of Ireland to? Tell me and I’ll enter you in a drawing for your choice of either the ebook or the print version. Only comments on this blog post by Dec. 3, 2014 are eligible, and only if claimed by Dec. 31, 2014. Subscribe to the comments or check back to see if you’ve won. Update. Karen Lewis is the winner of this book. Congrats and thanks for commenting, Karen! This entry was posted in Books, Brigid of Ireland, Cindy Thomson, ebook, historical fiction, Ireland and tagged Cindy Thomson, historical fiction, Ireland, novels on November 17, 2014 by cthomson. Gifts for St. Paddy’s Day! Happy St. Patrick’s Day! To celebrate, I would much rather talk about the country and its people than drink in a bar that Americans call an Irish pub. If you feel the same way, or even if you don’t–I don’t mind–I’ve got some things to brighten your day. And here’s something fun! My friend Corey over at the Irish Fireside is sharing a free ebook of sites to see in Ireland. If you’re not already, you really should be following the Irish Fireside! This entry was posted in ebook, Ireland, St. Patrick's Day, The Irish Fireside on March 17, 2014 by cindythomson.